As mentioned above, ITT Educational Services is having an horrible day in the market today after news came out of the Department of Education. Unfortunately, the US DOE said that it has made the decision to stop enrolling students into the school with federal loans. As investors, one of the first things that we learn is that it’s important to watch the news. Any time positive news is released with regard to a publicly traded company, we can expect to see gains in the stock that’s representative of the company. However, the news that was released with regard to ESI today was anything but positive. After all, a large percentage of the students that attend the school do so using federal money. 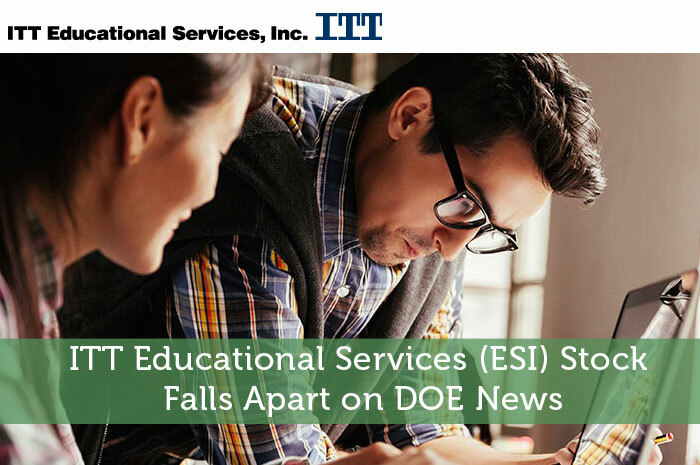 To make matters worse, the reason that federal loans will no longer be approved for ITT Educational Services leads to concerns among students, parents, and investors. The news today is a massive blow to ITT’s ability to move forward. Think about it, students that call in are going to be told that federal funding is unavailable. Of course, these students are going to look into why. When they find out that there’s no real advantage in the job market, they’re not going to want to go to that school. So, not only is the ESI going to see declines in revenue due to no federal funding, but they are going to have a hard time getting sales to recover thanks to the image this leaves behind. With all of that said, the stock is currently (3:00) trading at $0.52 per share after a loss of $0.88 per share or 62.86% thus far today. Moving forward, I couldn’t have a more bearish opinion with regard to what we can expect to see from ITT Educational Services. At the end of the day, the news that was released today shows that the company built a business on sub-par education. Essentially, the company is charging students for an education that means nothing in the workplace. I’d be surprised if the company even exists 10 years from now. Where do you think ESI is headed moving forward? Join the discussion in the comments below!